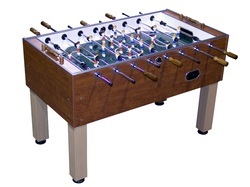 Established in 1984, Park and Sun Sports company is a relatively new player in the foosball table manufacturing industry. They are known for making numerous sporting goods like volleyball, badminton, lacrosse, bocce, shuffleboard, tetherball, horse shoes, and bean bag toss. 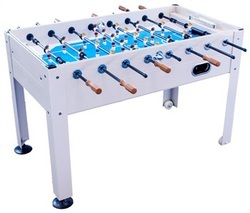 They currently manufacture 2 different foosball table models, the Lifestyle and Blue Sky, that range in features and price. The Lifestyle model also comes in an Oak and Black Diamond table color. Due to their extensive sporting research and knowledge of the industry, the nice thing about Park and Sun is they realize people like to play games outside. That's why they are one of only a few companies that offers an outdoor table in the Blue Sky that is great for your backyard or a tailgate. This table comes with a rain cover and is resistant to sun damage and moisture damage.